Dianne's Loom Talk: Some things just keep going wrong! Some things just keep going wrong! I see its quite a while since I talked with you. I have been very busy weaving, sewing and knitting but not things I can share as some are for the Festival fashion parade, some for the exhibition at Festival and others for my tutoring. And some things have gone really really wrong! Lets just say I wove a complete alpaca silk shawl before discovering an echo threading with 840 threads was wrong - a week designing, a week threading and weaving and not until I cut it off did I find the booboo. Woh is me. And what's worse the whole point of the exercise was to then expand the warp threads the full width of my loom to weave a banner for festival. Well! 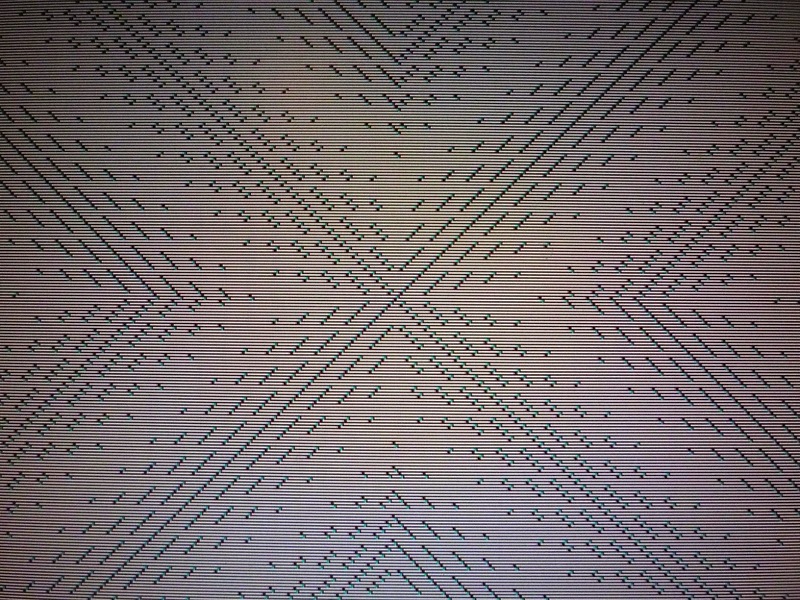 I couldn't believe so many things could go wrong, even this morning when I wove 30 rows of the pattern and discovered it was scrolling backwards. 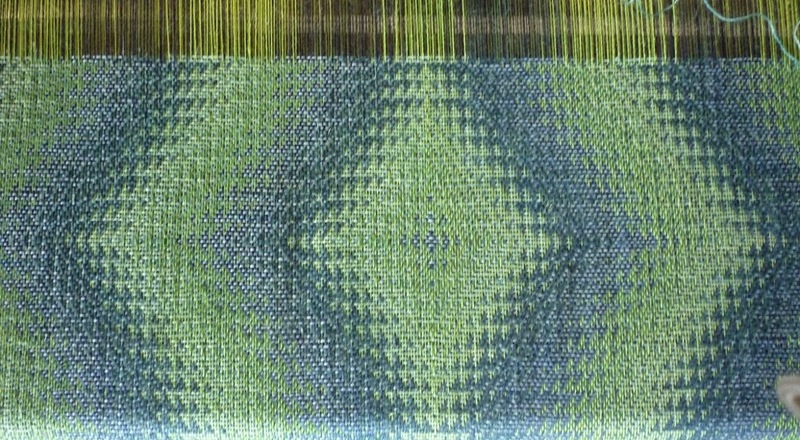 More unweaving. On the right track now and hoping all will be straight forward. I mean its not complicated. Now what do we call this - American? 4 colour double weave - two colours in warp and two in weft. Marian Stubenitsky's 4 colour double weave has 4 colours in the warp and 2 in the weft. Lets see if I can explain what went wrong. Make a new drawdown by taking the threading then draw the weft exactly as drawn in. One diagonal line through the tie up and you get this. 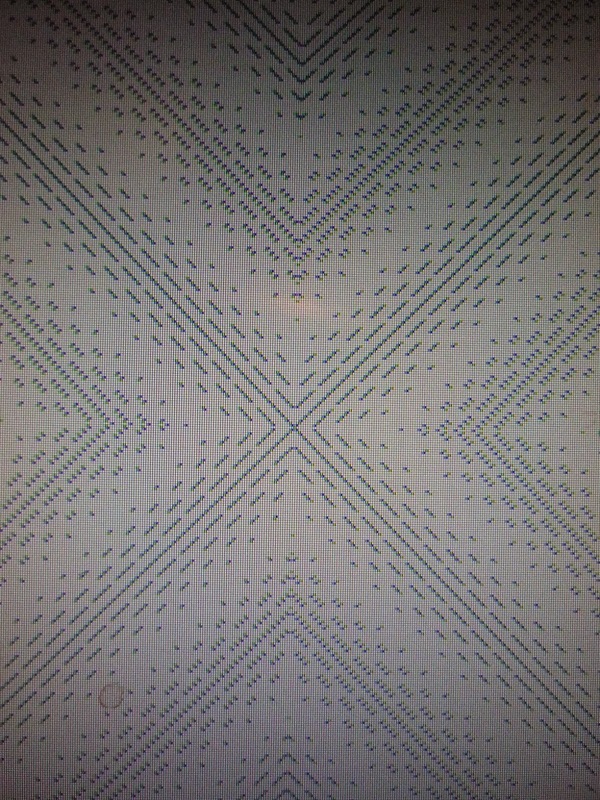 If reduced to its tiniest form all looks well (as I did) but enlarge it slightly (click on image to enlarge) and you will see the diagonal lines are different. Not a mirror image of each other. As they should be below. A simple way to check before weaving 2.2 metres of alpaca silk which is now in my wardrobe waiting for winter (which we are told will be late this year).